RESERVED DATABASES - Members are granted access to reserved databases (Some recent databases developments). April 16, 2019: Mariposa Co. (CA) Early Births & Certificates to 1980. March 3, 2019: 19th century State-wide vitals in New Jersey: here (Virtual-Film). February 19, 2019: 19th century vitals in Middlesex Co. (NJ): here (Virtual-Film). January 20, 2019: 17th century vitals in Hampton Co. (MA): here (Virtual-Film). January 14, 2019: Hartford, CT Divorces ~1832. January 14, 2019: New London, CT Divorces ~1719 - 1875. October 19, 2018: Fresno Co. (CA) Deaths 1878-1915. October 16, 2018: Plumas Co. (CA) pre-1900 Deaths, Cemetery Census. October 16, 2018: Sierra Co. (CA) more pre-1900 Deaths. September 31, 2018: Mono Co. (CA) pre-1900 Deaths, Marriages & Births. September 21,2018: California Information File completed. August 31, 2018: Fresno Co. (CA) Cemetery Census as of 1976, Births, Deaths, Marriages prior to 1900. July 31, 2018: Shasta Co. (CA) Cemetery Census as of 1976. July 30, 2018: Modoc Co. (CA) pre-1900 Deaths, Marriages & Births. June 15,2018: LaSalle Co. (IL) 1916-1926 Brides & Grooms added. May 28, 2018: Berks Co. (PA) Marriages 1823-1853. April 30, 2018: Dyer Co. (TN) Marriages 1860-1879. April 30, 2018: Williamson Co. (TN) Index to Wills 1800-1861. 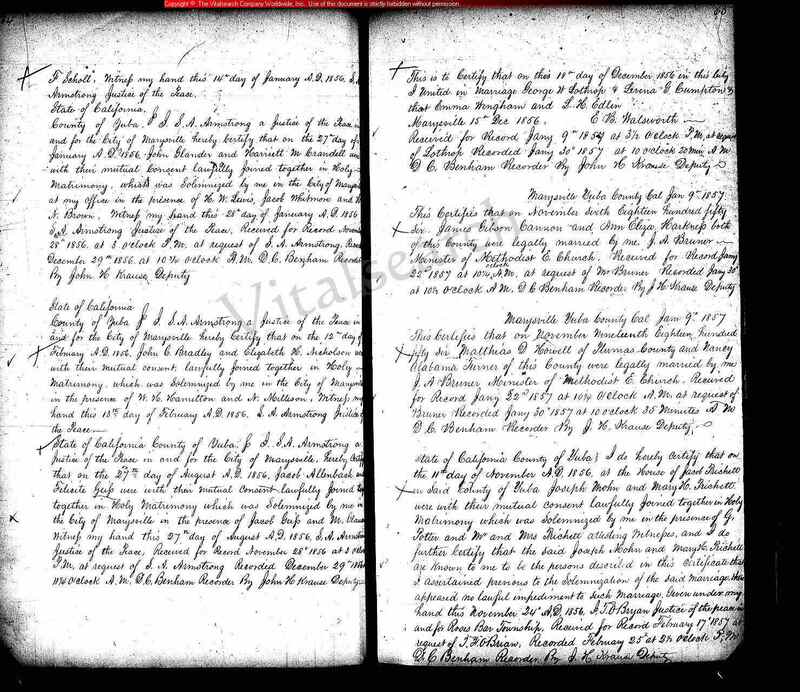 April 30, 2018: Davidson Co. (TN) Index to Wills 1799-1867. April 30, 2018: Hardeman Co. (TN) Marriages 1823-1861. April 30, 2018: Maury Co. (TN) Marriages 1852-1867. April 30, 2018: Montgomery Co. (TN) Marriages 1838-1867. March 28, 2018: Franklin Co. (TN) Marriages 1838-1874. March 27, 2018: Claiborne Co. (TN) Marriages 1838-1868. March 26, 2018: Fayette Co. (TN) Marriages 1838-1871. March 24, 2018: Carroll Co. (TN) Marriages 1860-1873. March 13, 2018:Pima Co. (AZ) Mortuary Records. March 13, 2018: Los Angeles (CA) 1890 Great Register. February 28, 2018: Anderson Co. (TN) Obituaries. February 19, 2018: California Information File completed through "T". February 13, 2018: LaSalle Co. (IL) 1878-1904 Brides & Grooms now spanning 1831-1915. January 24, 2018: El Dorado Co. (CA) 1902 - 1982 transcribed vitals completed. December 31, 2017: Mariposa Co. (CA) Early Death Certificates to 1919. 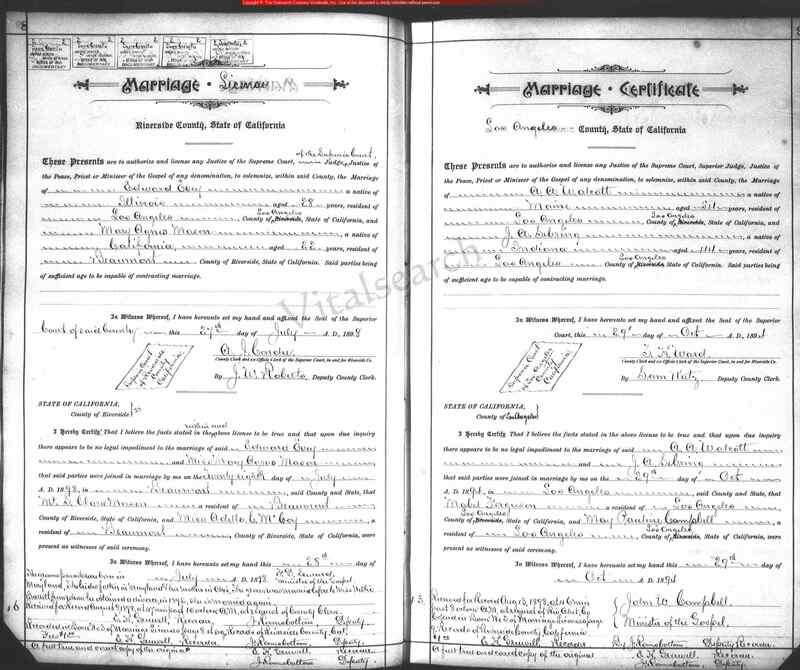 December 31, 2017: Mariposa Co. (CA) 1880 - 1919 Marriages Certificates. 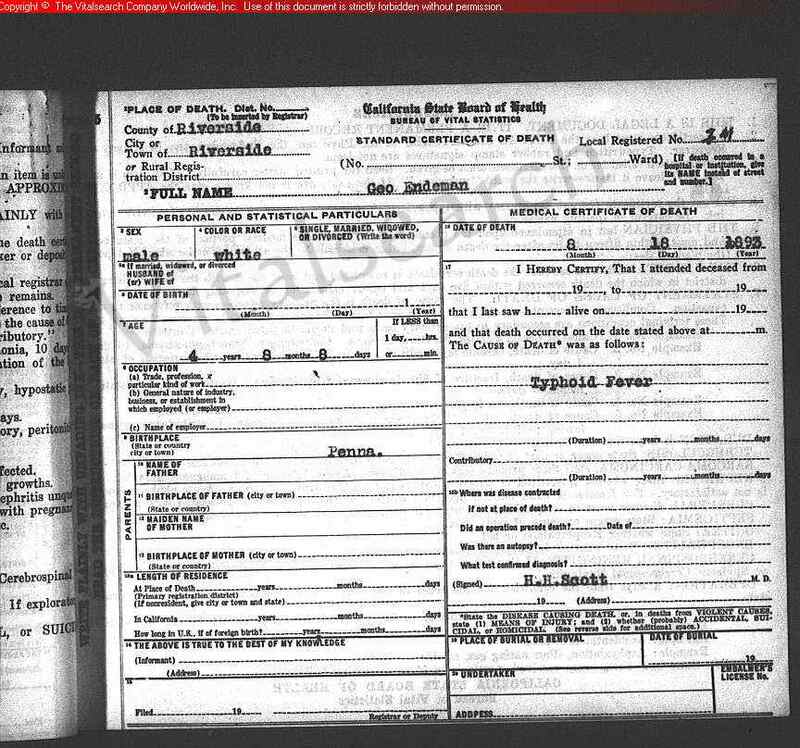 December 31, 2017: El Dorado Co. (CA) 1902 - 1982 transcribed vitals A-H.
December 28,2017: California Information File completed through "S". November 22, 2017: California Statewide: 2014-2016 Deaths added (761,314 names). November 4, 2017: California Statewide: 2014-2015 Births added (988,776 names). October 31, 2017: Tehama Co. (CA) 1905 - 1920 Death Certificates. October 30, 2017: Tehama Co. (CA) 1883 - 1913 Marriage Certificates. October 25, 2017: Sutter Co. (CA) 1900 - 1904 Marriage Certificates. October 25, 2017: Shasta Co. (CA) 1881 - 1905 Marriage Certificates. September 29, 2017: San Francisco City 1961 City Directory. September 29, 2017: Butte Co. (CA) Delayed Births prior to 1963. August 31, 2017: Sierra Co. (CA) more pre-1900 Marriages and Deaths. August 20, 2017: Tehama Co. (CA) more pre-1900 and early 1900 Marriages. August 19, 2017: Trinity Co. (CA) pre-1900 Marriages. July 28, 2017: Trinity Co. (CA) pre-1900 Births & delayed Births to 1976 & Deaths. July 28, 2017: Siskiyou Co. (CA) pre-1900 Marriages. July 27, 2017: Tehama Co. pre-1900 and early 1900 Births, Deaths & Marriages. June 28, 2017: San Joaquin Co. (CA) pre-1900 Deaths & Marriages. May 31, 2017: San Joaquin Co. (CA) pre-1900 Births. May 21, 2017: Sierra Co. (CA) pre-1900 Births & Marriages. Apr 20, 2017: Shasta Co. (CA) 1850 on Marriages. Apr 12, 2017: Shasta Co. (CA) 1870 on Births & Deaths. April 10,2017: California Information File completed through "R". February 22,2017:Adams Co. (IL) Deaths. February 22,2017:Adams Co. (IL) Brides. December 31,2016: California Information File completed through "Q". October 30, 2016: Kendall Co.(IL) Births & Deaths late 1800s. October 30, 2016: Edwards Co.(IL) Deaths 1933-1950. October 20, 2016: 2012-2014 State Compiled Marriages (TX) added. October 20, 2016: 2012-2014 State Compiled Divorces (TX) added. September 30, 2016: Edwards Co. (IL) 1900 - 1905 Births. September 30, 2016: Edwards Co. (IL) 1902 - 1933 Deaths. September 30, 2016: Edwards Co. (IL) 1910 - 1930 Marriages. September 30, 2016: DeKalb Co.(IL) 1876 - 1903 Deaths. August 31, 2016: California Information File completed through "O". August 31, 2016: Adams Co. (IL) Marriages. August 31, 2016: Adams Co. (IL) Births. August 31, 2016: DeWitt Co. (IL) Births. August 23, 2016: Washington State 1891-1907 Births. July 28, 2016: Putnam County (GA) Births 1927 - 1964. July 27,2016: California Information File completed through "M". July 22, 2016: Murray County (GA) Births 1873 - 1964. July 13, 2016: Multnomah Co. (OR): St. Joseph & Pioneer Cemetery in Gresham; Douglas in Troutdale..
July 13, 2016: Census of the Sandy Cemetery as of 1951, Clackamas Co. (OR)..
July 13, 2016: Tualatin Plains Presbyterian Cemetery Records. Washington Co. (OR) as of 1952..
July 1, 2016: Interment Records of Pioneer Cemetery - Clackamas Co. (OR). July 1, 2016: Jones and Silk Creek Cemetery Inventory (OR) on-line. June 28, 2016: Records of Baptism, First Methodist Church - Salem (OR). June 28, 2016: Records of the First Methodist Church - Salem (OR). June 27, 2016: Falls City Pioneer Cemetery (OR). June 26, 2016: Funeral held at W.T. Rigdon - Salem (OR). June 25,2016: California Information File completed through "L". May 31, 2016: Washington State 1969-2014 Marriages. May 25, 2016: Washington State 1969-2014 Divorces. April 22, 2016: more Lane County Deaths, Marriages & Births on-line. April 22, 2016: Drift Creek Cemetery Census, Lincoln Co. on-line. April 20, 2016: Washington State 1965-2014 Deaths. February 29, 2016: more Pioneer Family Genealogical Records of Oregon. January 28, 2016: some Skamania Co.Washington Births and Marriages. January 27, 2016: Index to Pioneer Donations in Oregon - Journals and Diaries as of 1963..
January 27, 2016: Interment Records of Milwaukee Cemetery - Clackamas Co. Oregon. January 27, 2016: Washington Co.Oregon Grant Deeds 1850-1891. January 27, 2016: Interment Records of Lee Mission Cemetery - Salem Oregon. December 27, 2015: 19th Century Oregon State Pioneer Registers with Index..
November 30, 2015: California Statewide: 2010-2013 Births & 2010-2013 Deaths added. October 20, 2015: 1870-1902 Oregon State Delayed Births. October 14, 2015: 1864-1890 Oregon State Marriages. October 14, 2015: 1864-1890 Oregon State Deaths. May 31, 2015: pre-1920 Births, Deaths & Marriages in San Bernardino Co. .
April 30,2015: pre-1920 Births & Marriages in Mendocino Co. (CA). April 30,2015: pre-1920 Great Registers,Deaths (including Cemetery Census) & Marriages in Tulare Co..
March 30,2015: pre-1906 Birth, Death (including Cemetery Census) & Marriages in Lassen Co. (CA). February 27,2015: pre-1906 Birth, Death & Marriages in Yolo Co. (CA). February 13,2015: pre-1906 Marriages in Imperial Co. (CA). February 9, 2015: Butte Co. (CA) Special Content. January 31, 2015: Glenn Co. (CA) Deaths, Births added. January 29, 2015: Solano Co. (CA) Marriages, Births added. January 21, 2015: Stanislaus Co. (CA) Marriages, Births, Deaths & "special content" added. January 16, 2015: Madera Co. (CA) Marriages, Births, Deaths added. January 13, 2015: Santa Clara Co. (CA.) Marriages, Births, Deaths added. December 29,2014: California Information File completed through "E". November 29, 2014: 1853-1950 Butte Co. (CA) Deaths. November 22, 2014: 1853-1950 Butte Co. (CA) Births. October 27, 2014: 1961 Chicago (IL. )Phone Book. September 30, 2014: 1863-1918 Nevada State Births. September 29, 2014: 1847-1917 Nevada State Marriages. September 26, 2014: 1863-1930 Nevada State Deaths. September 16, 2014: more Carson City/Ormsby County (NV) Vitals. September 11, 2014: 1911 - 1968 Clark County (NV) Births. September 10, 2014: more Lyon County Vitals. September 9, 2014: more Storey County (NV) Vitals. August 31, 2014: 1909 - 1951 Clark County (NV) Marriages. August 31, 2014: more Washoe County (NV) Vitals. July 31, 2014: 1924- 1983 Washoe County (NV) Obituaries. July 24, 2014: Humboldt County (NV) Births, Deaths & Marriages..
July 18, 2014: Douglas County (NV) Births, Deaths & Marriages..
July 15, 2014: an elaborate collection of Storey County (NV) Births, Deaths & City Directories..
April 24, 2014: various Nevada County vitals. March 25, 2014: 1855-1905 Merced Co. (CA) Births and Marriages. March 19,2014: UNDER CONSTRUCTION The rare and sought after California Information File. February 28,2014: 1854-1874 San Francisco Co.(CA) Births, Deaths Marriages. January 21, 2014: Humboldt Co. (CA) Births, Deaths Marriages. January 18, 2014: Sonoma Co. (CA) Brides. January 15, 2014: Calveras Co. (CA) Births, Deaths Marraiges. January 10, 2014: Del Norte Co. (CA) Births, Deaths Marraiges. January 9, 2014: Amador Co. (CA) Births, Deaths Marraiges. January 2, 2014: Alpine Co.(CA) Births, Deaths Marraiges. December 15,2013:1910-1920 Massachusetts State Births: Vitalsearch Premium Search Members* may enter here (Virtual-Film). July 29,2013: 1841-1970 Massachusetts State Deaths (8.00mm Names !! ):enter here (Virtual-Film). May 30, 2013: Kentucky State Births & Deaths updated through 2012. May 24, 2013: Arizona index to Newspaper Obits..
May 11, 2013: more vital statistics added to Cochise, Maricopa, Mohave, Navajo & Pima counties (AZ)(select from home page). May 4, 2013: 1873 - 1983 Coffee Co. (GA) Marriages. May 3, 2013: 1832 - 1942 Monterey Co. (CA) Births. April 30,2013: 2011 Texas State Compiled Marriages added. April 30,2013: 2011 Texas State Compiled Divorces added. April 24,2013: Fresno Co. (CA): Marriages: 1850-1919 . Vital Records to about 1850 by city compiled by Franklin P. Rice c. 1900. (See sample document (pdf)). County links from Massachusetts Home Page. March 31,2013: Colorado 1975-1991 State-wide Marriages. February 28, 2013: Tennessee State Marriages 1812-1909. January 31,2013: Orange Co. (CA): 1889-1956 Births, 1889-1955 Deaths . January 7, 2013: Ohio State Marriages 1970 through 2010. January 7, 2013: Ohio State Divorces various: 1962 through 2011. January 2, 2013: 1870-1920 Butte Co. (CA) Births. Monday, December 31, 2012: 1921-2008 Oregon State brides completed..
Monday, December 17, 2012: 1946-2008 Oregon State divorces-husbands completed..
November 20, 2012: Ohio State Deaths 1959 through 2011. September 30, 2012: 1908 - 2011 Ohio State Births (17mm records !!!). Deaths, Marriage and Divorces following. September 4, 2012: 2008 and 2009 Texas State Deaths. September 4, 2012: 2008 and 2009 Texas State Births. August 17, 2012: 1850-1905 Sacramento Co.(CA) Deaths. August 17, 2012: Alameda Co.: 1866-1878 (CA) Marriages. July 19, 2012: 2008-2010 Texas State Compiled Marriages & Divorces added. June 8, 2012: California Statewide: 1996-2009 Births & 2001-2009 Deaths. May 7, 2012: Kentucky State Births & Deaths updated through 2011. February 25, 2012: 1909 - 1949 Clark County (NV) Marriages. January 28,2012: Los Angeles Co.: 1901-1905 Deaths. January 28,2012: Orange Co.: 1936-1953 Brides. December 19,2011: Orange Co. (CA): 1914-1935 Brides & Grooms. December 5, 2011: 1873 - 1910 Contra Costa Co. (CA) Deaths. November 16, 2011: 1943 - 1972 Monterey Co. (CA) Delayed Births. November 14, 2011: 1846-1946 Santa Clara Co. (CA.) Marriages. November 9, 2011: 1853-1980 Butte Co. (CA) Deaths. September 8, 2011: 1905-1929 California State Deaths rescanned. August 22, 2011: Alameda Co. (CA):1873-1971 Delayed Births; 1860-1903 Deaths. August 15, 2011: Yuba Co. (CA): 1858-1860; 1873-1906 Deaths. August 15, 2011: Colusa Co. (CA):1873-1903 Births; 1943-1968 Delayed Births; 1873-1905 Deaths; 1853-1929 Marriages. August 15, 2011: 1847 - 1933 Sonoma Co. (CA) Marriages. July 27, 2011: 1859 - 1893 Monterey County (CA) Marriages. 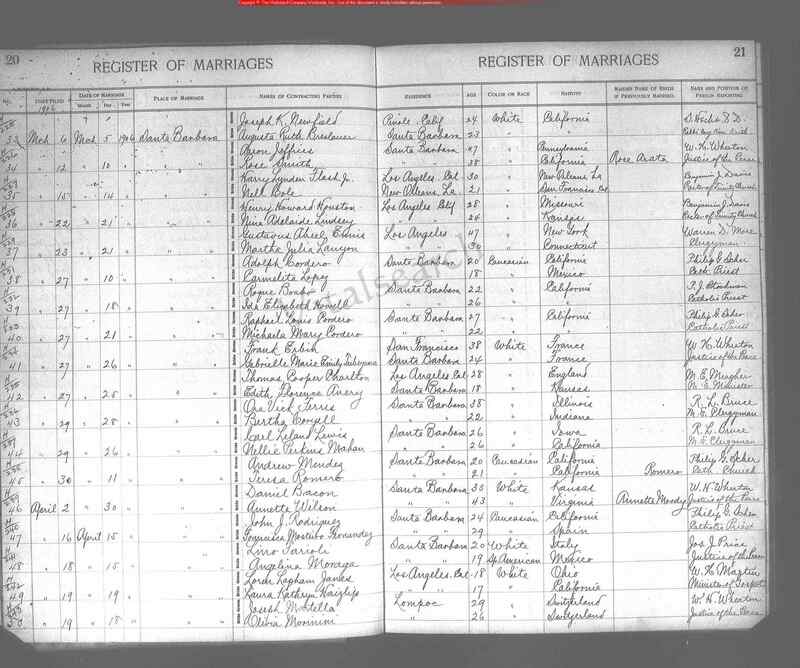 July 27, 2011: 1909 - 1940 Clark County (NV) Marriages. July 20, 2011: 1873 - 1902 Los Angeles (CA) Deaths. July 14, 2011: Maricopa Co. (AZ) 1889-1891: Grooms ; 1871-1889: Grooms ; 1871-1889: Brides . June 27, 2011: 1865-1873; 1882-1889; 1894-1896; 1900-1904 San Francisco Mortuary Records. June 23, 2011: 1894-1903 San Francisco Grooms/Elopements. June 4, 2011: Kentucky State Births & Deaths updated through 2009. May 24, 2011: News Alert !! Vitalsearch now accepts credit card payments directly. Paypal account not necessary. May 16, 2011: 2005-8 Oregon State brides. Premium Search Members* may enter here. All may view a sample document. February 21, 2010: Long Beach (CA) City Directories for 1925, 1930, 1935. January 15, 2010: 1903-1931 Phoenix, AZ City Directories: Vitalsearch Premium Search Members* may enter here (Virtual-Film). All viewers can see a sample image. 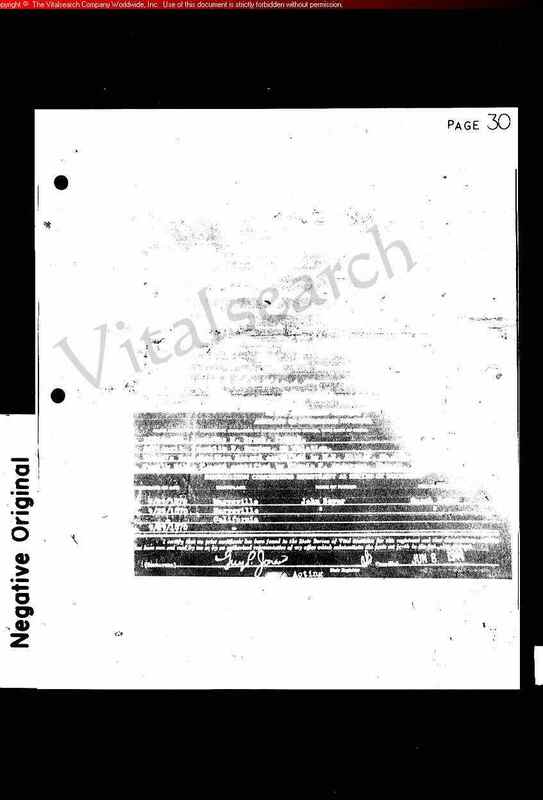 December 30, 2009: 1952-1970 Massachusetts State Divorces: Vitalsearch Premium Search Members* may enter here (Virtual-Film). All viewers can see a sample image. Premium Search Members* can view Here (Virtual-Film slideshow). All viewers can see a sample image. Premium Search Members* can view Here (Virtual-Film). All viewers can see a sample image. December 22, 2008: Los Angeles Co. Brides 1940-1949 completed. November 28, 2008: Los Angeles Co. Brides 1928-1939 completed. A rescan of the 1905-1929 California State Fetal Death Index. (Virtual-Film). All viewers can see a sample image. A rescan of the 1930-1939 California State Death Index. (Virtual-Film). All viewers can see a sample image. 1917-1919 Alabama State Deaths: Vitalsearch Premium Search Members* may enter here (Virtual-Film). All viewers can see a sample image. 1927-1965 Delayed Births and Deaths: (Virtual-Film) View a sample image. 1886-1965 Delayed Births: (Virtual-Film) View a sample image. 1888-1920 Grooms: (Virtual-Film) View a sample image. Premium Search Members* may enter here for 1888-1905. Premium Search Members* may enter here for 1906-1920. 1920-1965 Grooms: (Virtual-Film) View a sample image. Premium Search Members* may enter here for 1920-1947. Premium Search Members* may enter here for 1948-1965. Premium Search Members* may enter here. All can see a Sample Image. Premium Search Members* may enter here 1946-1950 (Virtual-Film). All viewers can see a sample image. Premium Search Members* may enter here 1951-1955 (Virtual-Film). All viewers can see a sample image. Premium Search Members* may enter here 1956-1960 (Virtual-Film). All viewers can see a sample image. 1946-1949: Vitalsearch Premium Search Members* may enter here (Virtual-Film); (Soundex). All viewers can see a sample image. 1950-1954: Vitalsearch Premium Search Members* may enter here (Virtual-Film); (Soundex). All viewers can see a sample image. Premium Search Members* can view Groom Indexed (Virtual-Film). All viewers can see a sample image. Premium Search Members* can view Bride Indexed (Virtual-Film). All viewers can see a sample image. Monday, July 21, 2008: Los Angeles Co. Brides 1856-1927 completed. 1924-25 Baltimore City Directory (Virtual-Film). All viewers can see a sample image. 1906-1910 Massachusetts State Births: Vitalsearch Premium Search Members* may enter here (Virtual-Film). All viewers can see a sample image. 1933-1934 Brooklyn (NY) City Directory:. 1920-1929: Vitalsearch Premium Search Members* may enter here (Virtual-Film); (Soundex). 1930-1939: Vitalsearch Premium Search Members* may enter here (Virtual-Film); (Soundex). 1940-1945: Vitalsearch Premium Search Members* may enter here (Virtual-Film); (Soundex). All viewers can see a sample image. 1888-1999 Washington/Oregon part I : Vitalsearch Premium Search Members* may enter here (Virtual-Film). All viewers can see a sample image. 1888-1999 Washington/Oregon part II: Vitalsearch Premium Search Members* may enter here (Virtual-Film). All viewers can see a sample image. 1907-1909 Washington State Deaths: Vitalsearch Premium Search Members* may enter here (Virtual-Film); (Soundex). All viewers can see a sample image. 1910-1919 Washington State Deaths: Vitalsearch Premium Search Members* may enter here (Virtual-Film); (Soundex). All viewers can see a sample image. 1920-1929 Washington State Deaths: Vitalsearch Premium Search Members* may enter here (Virtual-Film); (Soundex). All viewers can see a sample image. 1930-1939 Washington State Deaths: Vitalsearch Premium Search Members* may enter here (Virtual-Film); (Soundex). All viewers can see a sample image. All viewers can see a sample image. 1836-1932 Milwaukee Births can view Here (Virtual-Film). All viewers can see a sample image. 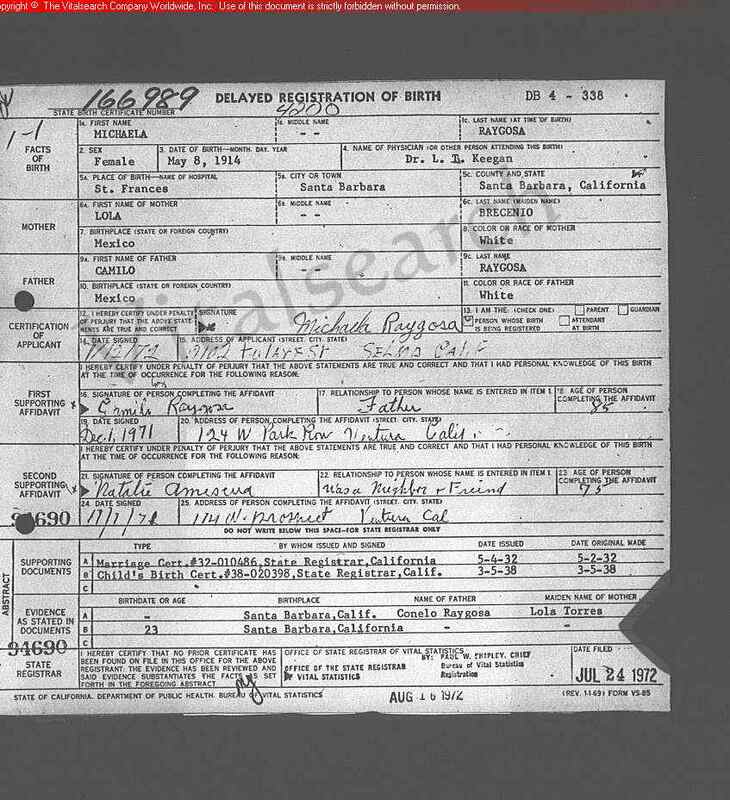 1908-1949 Mobile County (AL) Births: Vitalsearch Premium Search Members* may view Here (Virtual-Film). All viewers can see a sample image. 1917-1919 Alabama State Births: Vitalsearch Premium Search Members* may enter here (Virtual-Film). All viewers can see a sample image. All can see a Sample Image. Los Angeles Co. Brides 1913-1927. 1947-1965 Franklin County (GA.) Delayed Births/Deaths. 1930-1939 California Fetal Death Indexes. Manhattan/Bronx Phone Book for 1926. Heard County Georgia Marriages 1920-1965: (Virtual-Film) View a sample image. See this page for field descriptions. The start of Tennessee State data with 1908-12 Births: http://www.vitalsearch-ca.com/gen/tn/_vitals/tnbirthm.htm on-line. 1921-24,1946-60 Oregon State marriages: http://www.vitalsearch-ca.com/gen/or/_vitals/ormarrim.htm on-line. Texas marriages & divorces for 2005 can now be viewed by all.
. . . Because of your membership we can allow your searching to be unimpeded by the loading delays of ALL ads !! You can perform a Member Search by clicking HERE. Please view our Universal Search Portal for States being developed. Please continue to the Registration Page to become a Premium Search Member. (or select your "Back" button to return).